Groom your way to success in Pet Show Craze! Pets offer a lot of love, but they need a lot of care, too. Transform the cuddly kittens and adoring doggies of Petsville into "Best in Show" contenders. Along the way, you'll sharpen your business sense and become the talk of the town as you save Petsville from a greedy industrialist who wants to replace live animals with plastic imitations. 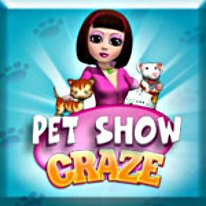 Catch the Pet Show Craze with thrilling gameplay and stunning graphics in 48 levels!